For the concluding session of the recent Pave symposium on Entrepreneurship, the Arts, and Creative Placemaking, we wanted to bring the discussion to a local level, so recruited the Phoenix chapter of Emerging Arts Leaders (EALPHX) to lead an interactive workshop. The team, consisting of Alex Nelson, Jessica Rajko, Korbi Adams, and Samantha Johnstone, developed a three-part workshop, which culminated in a short movement piece that embodied our conceptions of place, an Alphabet of Culture and Community, and the segment described following. Having participated in all the preceding sessions, the quartet identified three thematic challenges to creative placemaking efforts in the Phoenix area. They then asked participants to comment upon these challenges, write their thoughts on sticky notes (hence “sticky madness”), and sort them by theme. 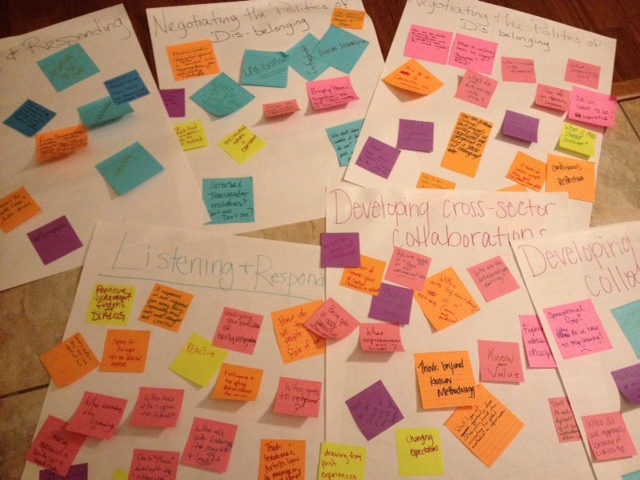 “The prompt to participants was to contribute their thoughts on how physical place, as well as personal and inter-personal relationships to place might contribute to those challenges or provide insight to those challenges, and then, if they cared to go so far, to share thoughts on how entrepreneurial arts activities could begin to work at solutions to those challenges,” according to Alex Nelson. The three themes were: 1. Negotiating the politics of dis-belonging (the subject of Roberto Bedoya’s talk), 2. 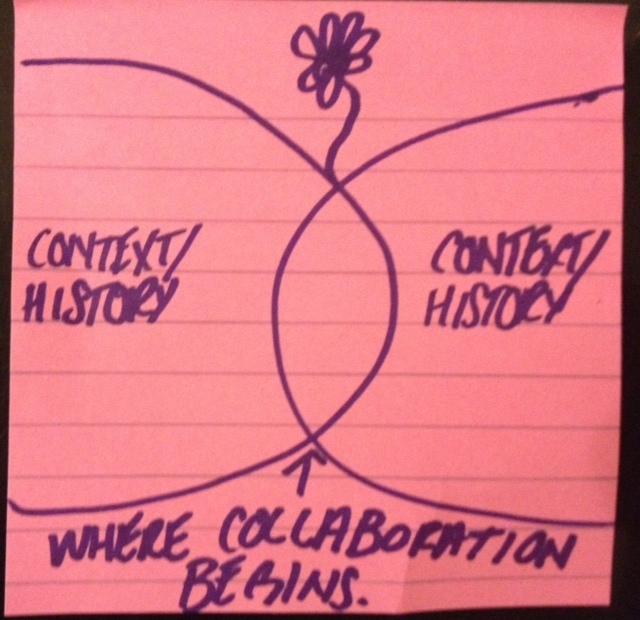 Developing cross-sector collaborations (which Ann Markusen described in her keynote address as necessary for effective placemaking efforts) and 3. Listening and responding (a theme central to Laura Zabel’s examples from the Irrigate Arts project). Below are the responses to these prompts, submitted anonymously by a group of about 25 students, artists, scholars, and community members. This is raw data – check back for analysis in a future post. Intersex trans-gender restrooms? Don’t ask don’t pee? How can my white privilege be transformed into a powerful voice for racial justice? What do we (artists) mean by change? Perception? Policy? Place? How do you determine belonging? In a transient society, do we belong? What is Phoenix’s shared culture? How can different cultural backgrounds within Phoenix be negotiated and connected to find a sense of belonging? Why do some strive, intentionally, to not belong in a place? We don’t have to resolve it today do we? Can we just explore the problem? Even further? Who is included in the discussion? Be honest with myself (and transparent) about what I want out of a project. Who are the collaborations serving? Realizing your own idea or truly responding? How do we teach people to listen? Role of education? 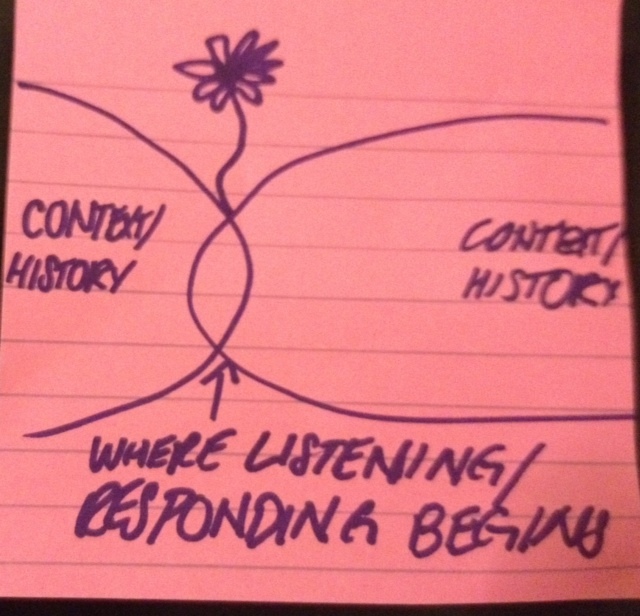 Does “place” disrupt the “listening” process? Who are we listening to most? Least? There is a multiplicity of story. We do not always have a shared history. Video of the entire symposium is available through our livestreaming partner, Howlround/newplay tv, in a raw unedited form. High res video will be available soon on the Pave website. This entry was posted in Arts education, Arts entrepreneurship, arts infrastructure, Arts policy, Culture and democracy, Higher education and tagged Ann Markusen, Creative Placemaking, EALPHX, Laura Zabel, Pave Program in Arts Entrepreneurship, Phoenix, Roberto Bedoya, Springboard for the Arts. Bookmark the permalink.